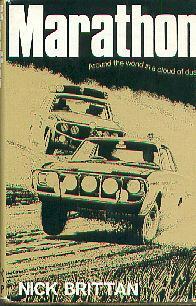 Journalist Nick Brittan participated in the first London-Sydney Marathon in 1968, driving a Lotus Cortina, with his wife Jenny Brittan as co-driver, and wrote this first-person account of the rally. 20 Cortinas (mostly MKII Lotus Cortinas) participated in the field of 100 entries, and several finished. (All had alternator problems en route...) Brittan's first person driver's account ends with a collision, on a mountain pass in Iraq, but he continued on to Australia, to cover the entire rally as a priviledged journalist/ex-participant. Published in 1969 by Motor Racing Publications Ltd, 62 Doughty Street, London, it is 157 pages, and contains many black & white photographs of the cars, participants and support crew. It is only available on the used market.